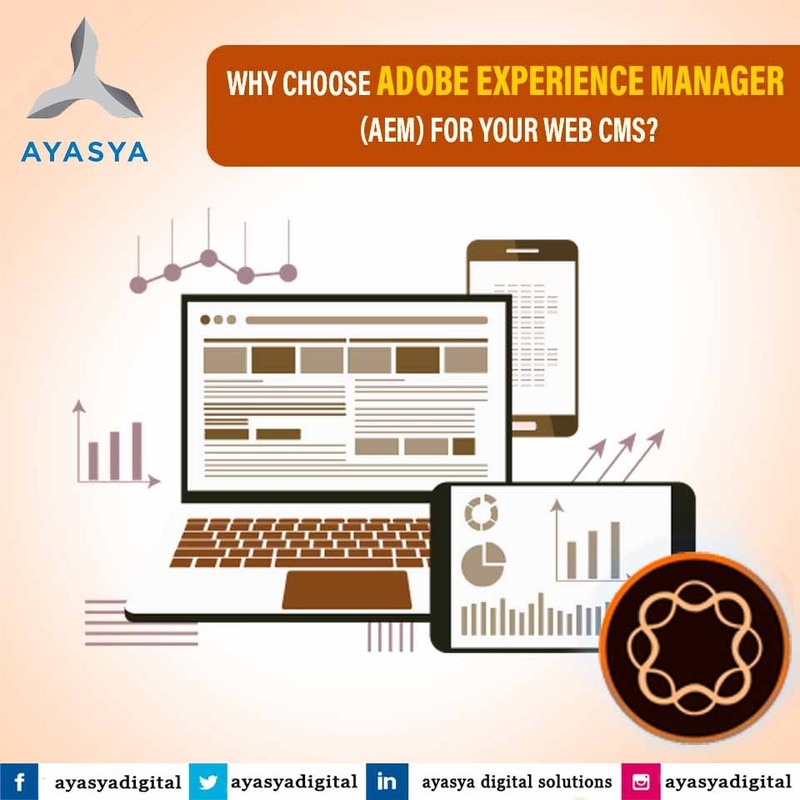 Why Choose Adobe Experience Manager (AEM) for your Web CMS ! What's more important today than your website and online presence? A leading reason is that it simplifies the management and delivery of website’s content, assets and reduces the complexity of delivering online experiences to the right customers. AEM itself is made up of five modules: Sites, Assets, Mobile, Forms, and Communities. Using all modules will provide you with a comprehensive content management solution for building websites, mobile apps and forms to manage your marketing content and assets more easily. 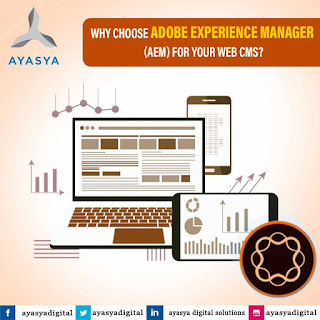 Adobe Experience Manager Sites is a content management system within AEM that provides one place to create, manage and deliver digital experiences across websites, mobile sites, and on-site screens. Sites gives you the functionality to personalize online experiences to make them more relevant and engaging. You can build and manage mobile sites and responsive designs from one single platform. Sites has tools to optimize shopping carts, sync product information from other systems like your ERP or product inventory management (PIM) system, or your e-commerce platform, and generate pages from catalog data. This is especially helpful for organizations who need to manage many sites across many regions and languages. With Sites, they can all be controlled from one centralized place. Send a unified digital experience from different devices such as desktop to tablet to smart phone and to on-location screens. Provides the ability to manage and launch marketing campaigns from one central location. Also organize and store your assets in Sites so they can be easily accessed and used for all of your campaigns. This module is used for Digital Asset Management (DAM) to help you create, manage and deliver content, images, and videos to any device or screen. It includes workflow capability, and is a better way to store, organize, customize, and access assets than on an employee's hard drive. Assets is easily integrated with the Creative Cloud so that you can bridge creative and marketing workflows. This helps you to deliver consistent quality experiences. Your assets can be accessed and managed from the cloud (also available in a Software as a Service, or SaaS, deployment option). Deliver personalized and targeted experiences to enhance engagement. Users can design workflows for planning, creating, reviewing, approving, and managing asset production. AEM Mobile: - The Mobile App Development and management platform within AEM allows you to create and deliver mobile apps for all devices and integrate your apps into your overall marketing strategy from a single view. Using a single code base, you can build mobile apps and deliver them to multiple platforms. Unpublished apps can be reviewed in real-time, speeding up the approval process. You can update content, review metrics, and package updates for app-store submission easily using one convenient dashboard. Using built in Adobe Mobile App Analytics, you can immediately analyze the performance of your mobile apps. Using an easy drag-and-drop interface, users can update apps, and also see changes instantaneously without going to the app store. Present consistent content to your customers by integrating your mobile app strategy with your experience management. Draw users back to your app by conveniently creating and sending push notifications. How To Drive Traffic From Social Media ! Adobe Forms is a document management system within Adobe Experience Manager. It makes the process of creating and managing forms and documents paperless, efficient and automated. Complex transactions are transformed into simple, digital experiences on any device. Present the best form experience based on location, customer profile and device; make forms more easy to find. Adobe Forms provides proactive security and tracking of sensitive documents. Develop automated workflows, and merge form data and documents with your existing systems. Measure user experience and effectiveness using insights from Adobe Analytics, Target and Campaign. Adobe Communities helps you to create online community experiences, including forums, user groups, learning forums, and other social features valuable to your brand, customers, and employees. Through forums, ratings, blogs and more, you can encourage interaction with your customers and employees. Using user-friendly interfaces and wizards, create and customize web communities that match your brand identity. If you'd like to learn more about Adobe Experience Manger (AEM) or AEM Development, you've come to the right place. We'll happily answer any questions you have about AEM Sites, Assets and Mobile. Add keyword in Tittle & Description of the web page. Minimum web page load time. Content should not be copied. Write on what is hot & make it unique, informative & entertaining. Post relevant links with comments on blogs & forums. Your content should be linked to your post or web page. Write guest posts for blogs & websites. Build your networks through social media, groups, blogs. Share updates through social media, podcast, on regular basis. Hold contests to built your brand, free giveaways are boost for businesses. Is Android App Development A Great Career Choice ! The mobile phone market is surging in the present world. The growth is increasing the demand for mobile application developers who have plenty of opportunities for employment. This demand will sustain itself, if not grow, so long as new and innovative mobile applications continue do well in Android, IOS and other platforms. Android dominating the market share occupying majority among all mobile operating systems, the future looks bright for android developers and others working on this platform. Therefore, whether you are fresher or an experienced professional looking to switch the career, Android is an excellent choice for you. This is due to the increasing number of mobile phone and android users. India has large numbers of smart phone users presently. A majority of these are Android users. The number of smart phone users is projected to scale up further to large numbers. And, the number of Android developers and users are also set to increase in tandem with this growth. The job market for mobile app developers is expected to grow by 32% from 2010 through 2020, creating huge number of new jobs. This will perhaps be the biggest increase ever witnessed for any job position, IT or otherwise. The bulk of these opportunities will be for Android and iOS app development, as these mobile giants have control of about 90% of all smartphones operating systems.The platform most likely retain a clear majority in the coming years, due to the value for money it offers and affordability. Mobile technology is not only ever-changing, but also highly competitive. A career in Android means a continuous process of invention. Once you have the skills to develop Android apps, it is up to you to design and develop interesting new apps and release them quickly in the market to gain the first mover’s advantage. It is for this reason, that Android development is a dynamic field that offers a serious challenge for those, who are up for it. 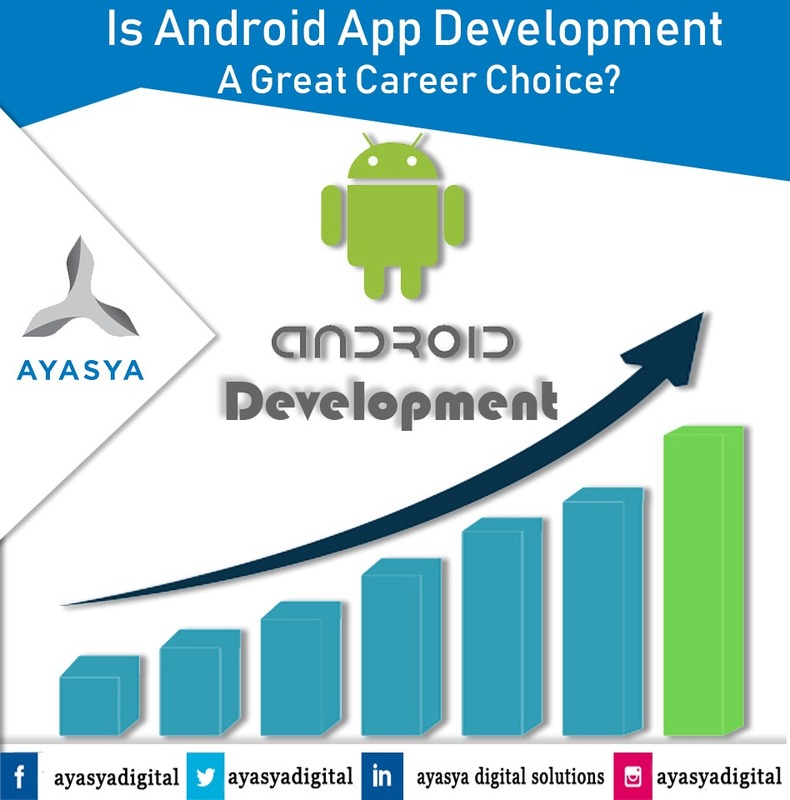 It is a good time to pursue a career in android development. It is not only an easy skill to learn, but also highly in demand. A career in Android development also offers plenty of freedom to learn and work. With the right training you will most definitely be on the right career path. So, learn android development now to build an exciting career. Things To Know Before Hiring A Web Developer For Your Website ! People often are not serious about website development or blog development if there is no ROI. Professionalism comes when people start looking this as a business opportunity and a means to pursue their hobby and passion. Proper planning and proper implementation can help people to achieve their goals in perspective of website development & deployment. The entire lifecycle should be understood and called down in the series of steps before hiring a professional web developer for one’s site. It’s an investment plan which is yet to give you fruits in the future so a person should be careful about its own choice of framework and quality of developer he needs to achieve that particular task. You should know how to market your website after your website comes online to get proper trac and hence to achieve return of investment. Most people are clueless about marketing cycle and spend hasty time and money in the development phase. This should be eradicated to get proper result. You should be clear about your set of requirements which you can brief to developer. Developer should have exact idea what you want from him. In most of the cases requirements are not properly capture which results in the fuzzy product. In the long run this product doesn’t produce enough prots to sustain them in the cloud. Despite of you being a non-techie guy or techie genius, in both the cases you should gure out the website architecture and layout. You can take suggestions from variety of people around but total website hierarchy should be clear and conned in your head. It helps in developing proper blue prints for website optimization to generate more traffic. You also need to decide on the framework and platform that your website will be using and after deciding the same you will proceed ahead to hire proficient developer in that field which falls under your budget range. Proper expertise should be pulled in to do the work in an efficient manner. If you are working or combining two different platforms than you should also be considering a single resource which might be proficient in both the genres or you need to hire separate resources for individual frameworks. Apart from development you should also analyze budget for Quality Analyst who will test performance and functioning of your site and will give feedback in either cases i.e. performance as per expectation and non-performance. Time constraints should also be clear in your plan. Many projects does span across months and years, because of that they are not able to generate expected output. Time factor should be conned and properly mentioned to the developer who is expected to take deadlines seriously and work according to that. Calendar events should be chalked out for every phase of the development cycle for the website to make it a success. Social media is the biggest growing platforms in this new generation. Going viral is almost everyone’s dream. If your company goes viral you make more sales because everyone are looking at you. Social media has taken branding to a new level because it’s easy to reach everyone around the world no matter where you are. Brands all over the world know how profitable social media is because their whole fan base is right there in front of them. Companies use social media in the best way to promote their products, services, businesses. Facebook, Instagram, Twitter, Linkedin etc. are the most used platforms for promoting your business because a large number of people and influencers use these sites. You can also promote your services, products by making videos on Youtube which is become a marketing surface for companies. 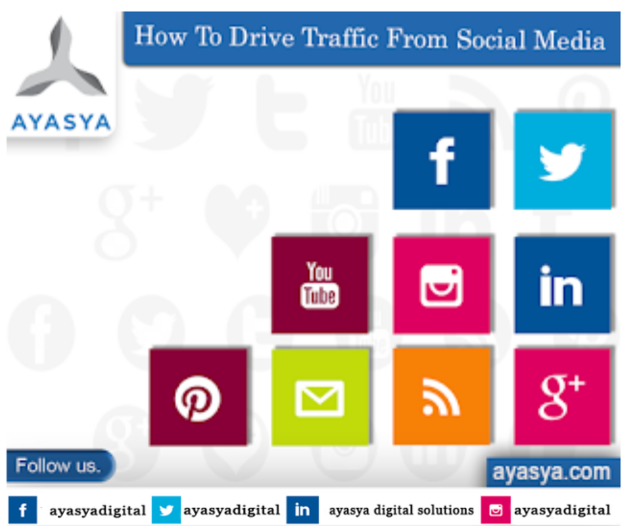 Drive targeted traffic, Social media marketing helps to understand the audience, Being active on social media builds relationships with audience, social media ads allow targeting & re-targeting the audience, A strong social media presence builds brand loyalty, Social media marketing increases your sales. Social Media is a place where you share your thoughts, dreams, memories, experiences, and skills. You can do whatever you want with it whenever you want. That is why everyone uses it ! We as Digital Consulting Company helps you to promote your products, services, businesses to large number of people by taking advantages of different social/digital medias. Therefore, as you can see, social media is a great marketing tool for all business big or small. By building your brand and your following on all of these platforms you will be getting free traffic to your website on a daily basis. 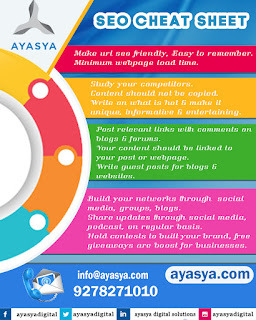 Ayasya Digital- India's Best Web Design & Development Company ! We provide Digital solutions using the latest web & mobile technologies that are tailor made to each & every users specific requirements. Our approach is different than most, because we take time to learn your business inside & out before we make a single technology choice. The end product you're looking for may be an android app, iPhone app, a revamped company website, or a new web application, but we know any technology is just a means for making your business more intelligent, more efficient and ultimately more profitable. Our Engineering process is the core strength. Looking to build a powerful analytics platform, to build the next billion dollar technology. Designing software isn't like adding a coat of paint. Well-built software thinks about users and their needs. We en-grain our years of user behavior analysis and human interaction into every project. Web Development- We are leading website development company who focusing on next generation web design and web development with quality of work on latest technologies. Mobile Application- Mobile application is a new way to engage more clients online. We are with the fantastic mobile app development service, we offer to your business a professional, lightweight and all device compatible ios and android application. Digital Marketing- We build and implement effective digital marketing strategies that creates a brand, generate leads & increase website traffics. Ayasya Digital is best website development, web designing company in Delhi,Noida,Gurgaon,India Specializing in mobile apps development,SEO,SMO & Digital Marketing services.